Timber-Pro Industries Inc in Logan Lake, BC offers custom-built machinery as well as extensive consulting and design services in the lumber and value-added wood product industry. We will modify the mill equipment you have, or custom design and manufacture new equipment as per your specifications. Timber-Pro’s lumber carts are efficient and easy to maintain to ensure safe transfer of wood in and out of the kiln. 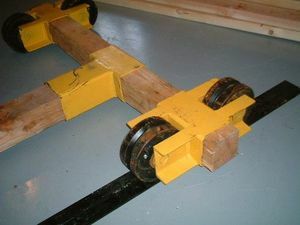 Handling the lumber from one phase of your operation to another requires a well-maintained kiln truck/lumber cart system, to avoid running a cart off the track. Such mishaps cause damage to the wood and halt your production. Kiln trucks designed by Timber-Pro are affordable, easy to transport, adjustable, flat and low in profile, easy to maintain including wheel and bearings, and available with various load supports and weight capacities. Contact us at Timber-Pro Industries for more information!